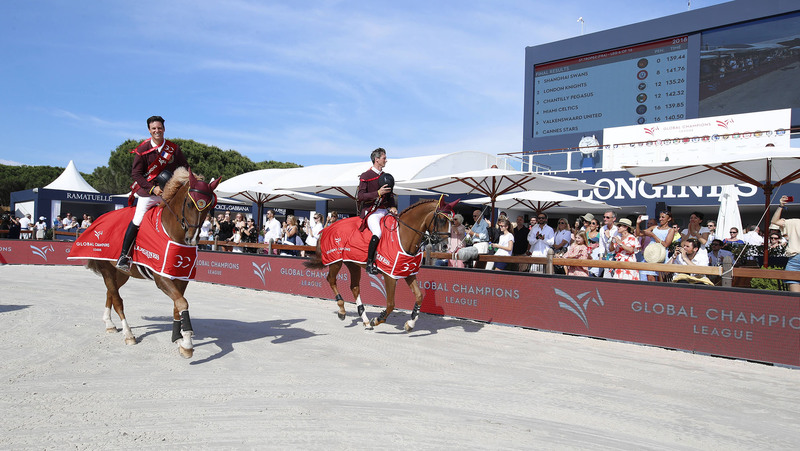 With their strong result at the Longines Athina Onassis Horse Show event, the London Knights keep hold of the overall ranking lead - now with 134 points overall. Moving up the order are Valkenswaard United, with a points tally of 118 and after their win today the Shanghai Swans sit in third, with 107 points overall as the Championship race heads along the French Riviera to Cannes. A double clear from Valkenswaard United’s Alberto Zorzi with Fair Light van T Heike and just four faults from Bertram Allen with Gin Chin van het Lindenhof meant the 2016 Champions would briefly take over the top spot, looking to claw back their disappointing day one result. The team would go on to rise meteorically through the field, as time and time again the world’s best were caught out by the tricky course. St Tropez Pirates rider Edwina Tops-Alexander put in an inspired round with California to deliver a clear for the team, but a further 8 faults from Pieter Devos and Espoir put them out of a podium position at their home city event. Tactics proved crucial once again; Cannes Stars pulled star striker Sergio Alvarez Moya and Charmeur off the bench, their strategy playing off brilliantly as the pair delivered a clear - they too shot up the leaderboard. First to go Veniss and Quabri de I’Isle kept the Swans in touch, after a stunning clear from the stallion and the consistent Brazilian star. Knowing he could afford one rail down Deusser cantered into the ring, his bright chestnut horse Tobago Z gleaming in the Saint Tropez sun. Taking off at a careful but quick enough pace, Deusser made the most of his small stallions deftness, shaving off time around the corners but opening up the elastic horse over the wide oxers. Denis Monticolo, LAOHS Event Director: "Well done to all the riders. It was a great show and I am sure this event will grow in the future." Jan Tops, Co Founder GCL: "It is a special spot in the world, amazing organisation. It was very exciting with the teams going up and down, a lot of turbulence and the team that one really deserved it. Four clear rounds for Daniel and Pedro, so well deserved. In the ranking the London Knights have been very consistent and go far ahead. Everything is very close so it is going to be very exciting. Sixteen teams go to the Play Offs in Prague and everyone wants to be in the top four teams going straight to the semi finals." Olivier Philippaerts, London Knights, 2nd place: “We knew that after the first day and the goal was really to be in first place - we would have some work to do to catch up. We wanted to be ahead of Valkenswaard to open the gap [in the overall rankings], so we’re pleased with second today." Pedro Veniss, Shanghai Swans, Winning Team: "We are very happy, we are celebrating the result and really happy to win today!" Daniel Deusser, Shanghai Swans, Winning Team: "At the beginning we never had bad results but did not make it to the top. Now we have two times podium and it really feels that between each other it makes the click - we understand each other and which horse to go to which competition. Today I had the possibility to have four faults and we would still win, so a bit of pressure off me. I think we have a great team!"